The problem WARM addresses seems simple on first glance: Recycling is better than landfilling, right? But is recycling better than composting? What about reducing usage at the source? And what exactly do we mean by "better," anyway? WARM was designed to answer these questions. The WARM tool is a database that calculates GHG emissions across six waste-management modalities. Users can try different combinations of these practices, virtually sending X tons of waste to an incinerator and Y tons to an anaerobic digester, for instance, to see which multimodal approach leads to the least GHG entering the atmosphere (which explains what we mean by "better"). Crucially, WARM factors both upstream and downstream GHG costs into its equations, consistent with a life-cycle approach to measuring environmental impact. This is why source reduction is such a powerful strategy in battling air pollution; it does away with upstream environmental costs entirely. Source Reduction - Also known as waste reduction or pollution prevention, this is the first-line defense against the production of GHG within the waste stream. Source reduction encompasses a wide variety of strategies to prevent the creation of waste. These include limiting packaging, donating unused products, and data-driven purchasing. Within the WARM algorithms, source reduction often produces a negative GHG rating, and can offset the carbon footprint of other waste-management strategies. Recycling - Recycling of non-organic materials incorporates a few necessary steps, from material collection to sorting to processing to, finally, manufacturing new products. The recycling circle is not complete until consumers purchase the recycled products. However, processing can contribute to the waste stream's production of GHG, making recycling the second-tier approach to GHG reduction. Composting - Composting is a way to recycle organics, significant especially because organics make up the bulk of the typical municipal solid waste (MSW) stream. (Food waste alone accounted for 28 percent of MSW in 2013.) Composting is second only to source reduction in terms of GHG-reduction for organic materials. Anaerobic Digestion - This specialized form of organic-waste management creates two valuable resources: biogas and digestate. Biogas can be converted into energy, while digestate is a nutrient-rich material that can improve soil for agriculture. There are several methods of anaerobic digestion (wet and dry, cured and directly applied), but all of them can create negative-GHG according to WARM's algorithms to some extent. Combustion - Combustion — literally burning waste — is not necessarily the environmental hazard it might seem on first glance. In fact, combustion is a key waste-to-energy strategy, and is still preferable to treatment and disposal in landfills. Landfilling - In the EPA's Environmental Protection Hierarchy for sustainable materials management, landfilling comes in dead last. While certain facilities do collect the methane that rises from landfills, repurposing it for energy production, landfilling tends to contribute the most to GHG emissions from the waste stream. The WARM tool offers dependable estimates of exactly how much GHG each ton of landfilled waste might create. Of course, not every strategy is effective for every material, and different materials are associated with higher or lower GHG emissions. To take these differences into account, the WARM tool algorithms include data on 54 distinct waste materials. These include everything from aluminum cans to newspaper to dairy products. For the full range of materials included in the WARM tool, as well as data sources on GHG contribution, see the EPA's comprehensive list here. The first, million BTU, describes the amount of heat it takes to raise the temperature of a pound of water by 1 degree Fahrenheit. The latter two — MTCE and MTCO2E — measure emissions of the global-warming potential of all common greenhouse gases as an equivalent of either carbon alone or carbon dioxide, respectively. Note that WARM is only effective for modeling the life-cycle GHG emissions of various waste-management processes. It does not provide direct data projections for other common types of environmental impacts, such as the release of toxic materials or the use of water. The GHG Equivalencies Tool presents this data in simple, clear infographics. The WARM tool is available both as an Excel spreadsheet and as an OpenLCA database. Both options are free to the public. The current version, as of this writing, is 14 — but the EPA makes all previous rollouts back to WARM 1 available on its website. Regardless of which version you use, the first step is to enter data on the current method of handling waste materials. This will establish a baseline against which WARM will calculate GHG savings. Users navigate through the list of 54 material types, entering the number of tons of each currently being handled through landfilling, recycling, composting, and etcetera. The cells to fill out in the Excel version are shaded blue; the OpenLCA edition offers editable fields that are easy to identify. The final column in the baseline section of the spreadsheet identifies the total number of tons of waste the system generates; the volume of waste the system handles must add up to the number in this column. Next, users enter new figures for a proposed change in the waste-handling system. If you start with all waste going to the landfill, for instance, and you are considering introducing recycling for certain materials and composting for others, make these changes in the "alternative management scenario" section of the spreadsheet. You might notice that the baseline section of the sheet only lists five material-management strategies, whereas the alternate-scenario section lists all six. This is because source reduction can only be measured against an existing baseline. Waste materials not already being generated would have no value in a baseline calculation. The current version of WARM controls for other inputs to GHG emissions, including electricity use in landfilling and combustion systems, composition of materials in source reduction strategies, and types of anaerobic digestion. Select from dropdown menus or enter figures for these conditions. Once you've entered all of your system's data into the sheet, you can view the summary results and a comprehensive analysis report in terms of MTCO2E, MTCE, and BTU. With these GHG-reduction figures in hand, you can navigate to the EPA Greenhouse Gas Emissions Calculator to convert these abstract numbers into relatable savings. Clearly, WARM offers a powerful tool for planning alternate material-management strategies. 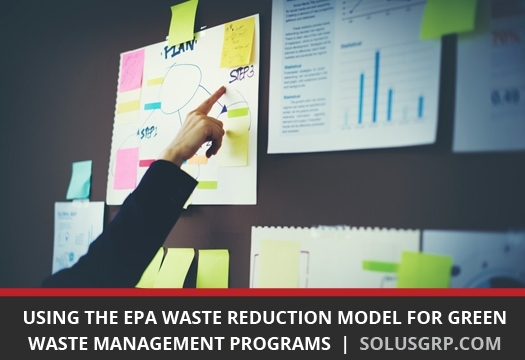 It provides reliable data that governmental bodies and other decision-makers will need in order to choose greener waste-handling strategies. It also makes for a fascinating research tool. Given the number of factors that go into GHG emissions, the most obvious choice isn't always the most sustainable. To learn more about using the EPA Waste Reduction Model, or to access the tool itself, visit the WARM homepage here. "Energy Recovery from the Combustion of Municipal Solid Waste (MSW)." EPA. U.S. Environmental Protection Agency, 13 Apr. 2018. Web. 5 July 2018. "Energy Units and Calculators Explained: British Thermal Units." EIA. U.S. Energy Information Administration, 13 June 2017. Web. 5 July 2018. "Glossary of Climate Change Terms." 19January2017Snapshot.EPA. U.S. Environmental Protection Agency, 19 Jan. 2017. Web. 5 July 2018. "Greenhouse Gas Equivalencies Calculator." EPA. U.S. Environmental Protection Agency, Sept. 2017. Web. 5 July 2018. "Municipal Solid Waste." Archive.EPA. U.S. Environmental Protection Agency, 29 Mar. 2016. Web. 5 July 2018. "Overview of Anaerobic Digestion for Municipal Solid Waste." GlobalMethane. Global Methane Initiative, Oct. 2016. PDF. 5 July 2018. "Pollution Prevention (P2)." EPA. U.S. Environmental Protection Agency, 26 June 2018. Web. 5 July 2018. "Sustainable Materials Management: Non-Hazardous Materials and Waste Management Hierarchy." EPA. U.S. Environmental Protection Agency, 10 Aug. 2017. Web. 5 July 2018. "Waste Reduction Model (WARM)." EPA. U.S. Environmental Protection Agency, 4 Jan. 2017. Web. 5 July 2018.